1. Play more music--yes, although Desert Boy has made more progress than me! 4. Eat healthier--yes. Just reading food labels makes a huge difference in awareness. 5. Give more--yes, I was able to give more time to my husband and we really enjoyed our date nights! I even managed some of the bonus items, like raising chickens (although it took a lot of perseverance and we're now on chickens #10, #11, and #12), reading the Bible in a year (on week 50! ), writing more, self-publishing a children's book (see sidebar for details), taking some trips, getting some structural fire training, and recertifying as an EMT. Woohoo! So what's for 2015? I like challenges, it keeps my competitive spirit happy. So I'm going to call my resolutions my challenges. Plus, some of these I developed throughout last year. 1. 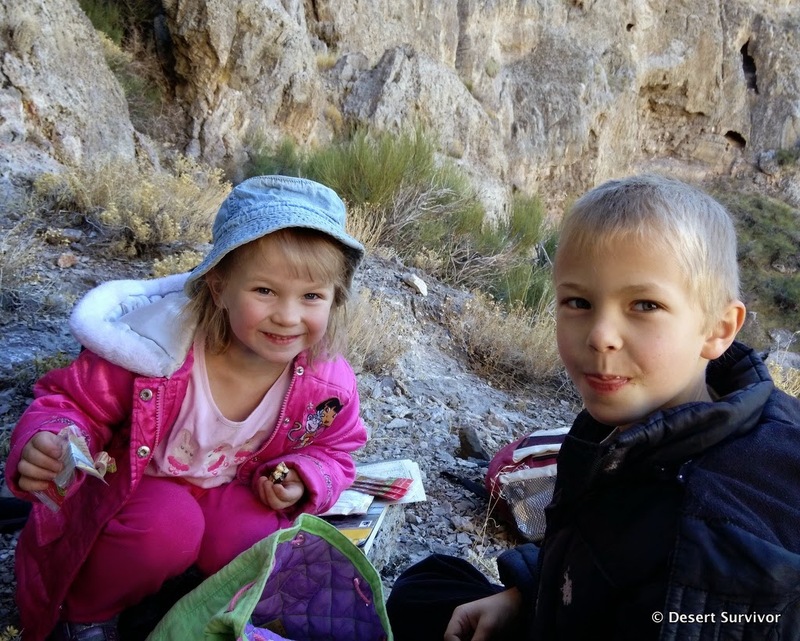 Desert Survivor's Get-Out-and-Camp Challenge. Our goal is 12 nights. Last year we made 11! 2. Desert Survivor's Backyard-Bird Challenge. We will count all the different bird species we see in our backyard. Last year's number to beat: 34. 3. Desert Survivor's Try-a-New-Recipe-Every-Week Challenge. I don't think this one will be too hard, but I'll report on the great successes and the flops. 4. 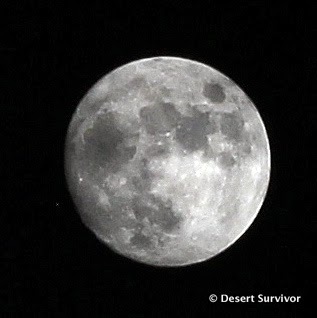 Desert Survivor's Photograph-the-Full-Moon-Every-Month Challenge. This is a new challenge I'm developing that I'm super excited about. Stay tuned for details! And since challenges are more fun with friends, you all are invited to join in! Desert Boy goes to a one-room school with ten kids total in grades kindergarten through second grade. Every year his teacher picks a different theme for the year, which is an excellent idea to keep things fresh and the kids engaged. This year the theme is different countries, with each student picking one. Desert Boy chose Norway (I think at least partly influenced by the movie Frozen, which he honors frequently by singing the songs from it). The teacher writes the Christmas play, and this year the students were visiting the International Space Station and telling each other about the countries they came from. They made such cute astronauts! It took me a little while to get my manual settings correct for the indoor lighting. I was doing better by the time the next group came on stage, the 3rd-6th graders, who also attend a one-room school (actually the school has more than one room, but all 15 kids are in the same classroom with one teacher). They took us to the tropics for a pirate-themed play with lots of song and dance numbers. They had obviously put in a lot of time to get the choreography right and memorize all the songs and lines. Afterwards Santa arrived, and my kids ran to get in line to visit them. Desert Boy had no qualms about sitting on Santa's lap. He asked for a toy light saber. But later, in the retelling, it sounded like he wanted a toilet saver. So now that's a family joke. Desert Girl wasn't at all certain about sitting on Santa's lap. She couldn't think of what she wanted. She got uncomfortable. I thought she might cry. Finally she got her bag of candy, peanuts, and a Cutie, and quickly departed. Most of the kids enjoyed their visits with Santa, though, including this little guy whose father was afraid that his child might recognize Santa. I think he was safe. Merry Christmas! The excitement is building in our house. The kids will be in a Nativity play on Christmas Eve, playing an angel and King Herod. We had a dress rehearsal the other day, which is one of my favorite times to take photos because I don't have to stay in my seat. The play begins with Gabriel announcing to Mary and then Joseph what is to come. Then they sing O Come Emmanuel (with the help of the Innkeeper). Meanwhile, the Wise Men were busy finding wise things on their smartphones. Ha, ha. The kids were really into singing. Desert Girl added a little stretching. She has a really hard time sitting still for 20 minutes. I'll just pretend she's fluttering around like an angel. The little kids always add some comedic relief to the play. Thank goodness they have the older kids to hold it all together. Of course, sometimes the older kids have their fun too. Mary decides her feet are sore, so she puts them up on the makeshift manger. I remember putting my feet up a lot when I was pregnant. Later, Joseph and Mary had a little tussle over who got to hold the improvised Baby Jesus. It was funny to watch. The shepherds hung out on their hill, tending their sheep. Actually all their sheep were missing (the cast is a little small due to families being out of town), so they just played with their imaginary sheep. And tried out some wrestling moves. The angels didn't approve. Meanwhile, King Herod waited patiently on his throne, running shoes ready to make a mad dash if need be. The three Wise Men came to visit him and find out where the newborn King was. And the play ends with Joy to the World. It is so joyous to see the kids better understand the Nativity play and the true meaning of Christmas. We'll see what interesting expressions transpire on Christmas Eve as they do the play with a big audience and lights and microphones. It's always good for a few chuckles. Thanks so much to Sharon for organizing it and directing the aspiring actors. Last Sunday morning we decided to take a hike. We couldn't go too far or too long because we had to get back in time for church, but we knew we wanted to get out and celebrate nature. The weather was cooperating, cool, but not cold or warm. And the recent dusting of snow on the higher mountains made them look so big. Before long our truck looked tiny. You can see snow-covered Wheeler Peak and Jeff Davis Peak in the background. 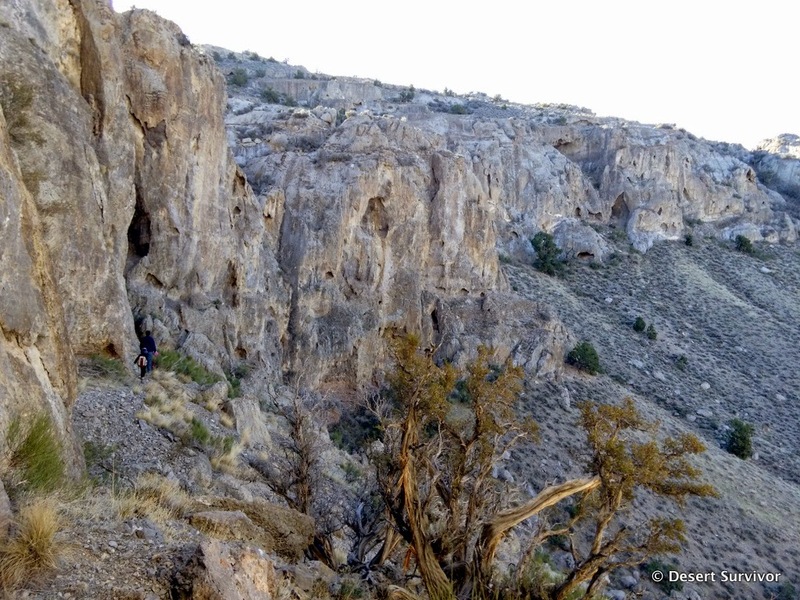 We went up a small canyon we had never been in before. We all agreed (well at least the kids and I did) that we should take ropes next time! Holes pocked the rock faces, and we walked the base of the cliffs looking for caves. Of course we had to take some snack breaks. And check out some holes. I also had fun trying out a new lens, a 100mm macro. In the shade, frost clung to the leaf margins. The backlit rock spirea was gorgeous. We weren't content to stay in our little canyon, so we found a way to scramble to the top (the dog had the hardest time). We then had a nice view of Garrison, Utah. Going a little higher, we reached this view. Time was running short, so we had to find a way down. We cliffed out one way so had to backtrack and find another way. 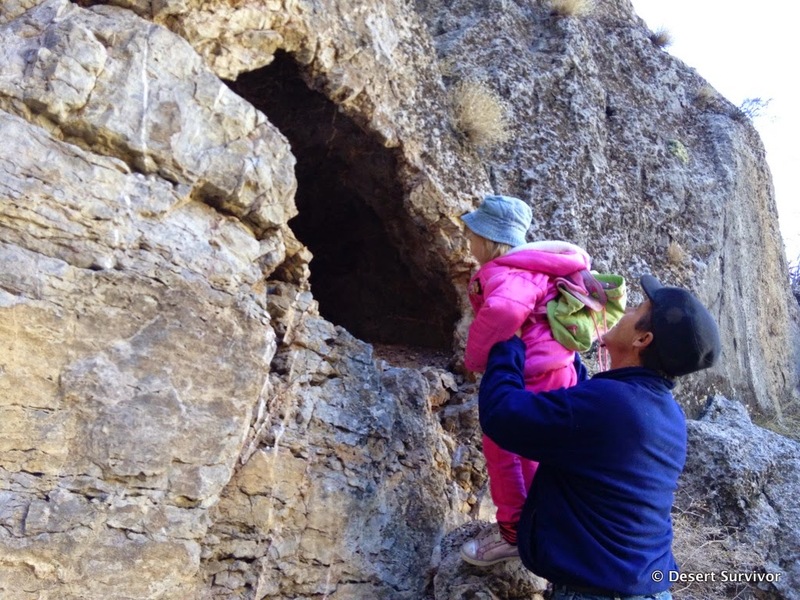 It was a fabulous hike, even if the kids got a little crabby at the end. My husband and I really like checking out places that don't have trails and test our scrambling abilities. It's even better when they're just a short drive away! p.s. The winter light was fantastic for photography. Shadows will be at their longest today, winter solstice. Happy shortest day of the year! …to the Polar Express we go. We found it in East Ely, with beautiful sunlight on the Schell Creek Range. The Polar Express is a big money maker for the Nevada Northern Railway. They had three passenger cars hooked up to a diesel engine, and three trains running on Saturday. We opted for the 4:30 train. They have a special license so they can follow the story of The Polar Express. We got our Believe tickets and boarded the train. We went with friends, and the kids had so much fun hanging out together. The train was nicely decorated. As we pulled away from the East Ely Depot, waiters adorned in white coats passed out hot chocolate and chocolate chip cookies. We all enjoyed those! We listened to the story of The Polar Express as the waiters showed pictures from the book. We also had fun looking out the window to check out the holiday lights. Before long we arrived at the North Pole, where Santa and an elf got on the train. Then came the hardest part: waiting for Santa to arrive at our train car. The kids were getting quite impatient. We probably waited about 45 minutes, so it was a long time to be parked there, the windows fogging up. The waiters tried to help time pass by singing "Santa Claus is Coming to Town". Finally, Santa arrived. Desert Girl is still somewhat scared of Santa, but Desert Boy isn't. Even though he doesn't believe, he still doesn't hesitate to tell Santa what he wants (something his parents aren't going to get him, and he knows it). The way back was relaxing with the click clack of the train wheels over the track. We sang some Christmas carols and then entertained ourselves. I almost forgot the best part of the trip. A waiter mentioned soon after we got on the train that we were heading north to the North Pole. Desert Boy said in a loud voice, "We're not going north!" He was right, we were heading west. Everyone started laughing, it was delivered just at the right time and the right tone of voice. The conductor came over and tried to convince him, but Desert Boy knew better.